Marlene Dietrich, here I come. The best complement to this coat would be a stunning pair of leather gloves, a shot of cognac and a cigar. Puff, puff. Keeping warm on those unusually crisp fall outings never looked quite so chic. Who said plaid was only for lumberjacks? Made in the U.S.A from 100% wool plaid coating (with plaids impeccably matched, of course), Lined in flannel backed acetate Kasha coat lining. Collared in a sultry soft cotton velveteen. No expense was spared in the making of this luxurious coat. What Sunni wants, Sunni gets. I was thinking about making myself a coat this year. I mean, I think about making myself a lot of things every year (who doesn't) but you know, life happens. You get sucked into a vortex of so many things you want to make and you absurdly think that you can until you actually start making something and you realize that you don't have time to make all the things. It's a weird phenomenon and I often wonder whether the same thing happens to all of you. In my head I have a smashing line-up of fall outfits to crank out. In reality, I have an alarmingly small amount of time to crank them out. Goodness, at least this coat got done. I did decide on getting this coat done. I was determined! I have a plentiful amount of fabric in my personal stash, but low and behold, I had been eyeing this particular plaid coating for what seemed like an eternity from a local shop. It's so weird, by the way, to still want fabric even though I so much of it. Anyway, when the new Named Fall patterns made their debut, I was all over this coat like white on rice. For the most part, it had everything I wanted. For the most part. When we're talking coats and jackets, of which I'm a particular connoisseur if I do say so myself, there are so many elements that I am fairly particular about. Let's take the issue of pockets for a minute. You know, patch pockets are fine, but I had no intention of patch pocketing this coat. In coats, I'm particularly keen on pockets that are easy to sink my hands into and keep my hands warm. There is nothing like a welt pocket for this job in my very humble opinion. Coat pockets, for me, have got to be easy to put my hands in. I am so over awkward coat pockets! Are you with me here? Suffice it to say, I drafted my own welt pocket for this coat and if I do say so myself, its one perfectly placed welt pocket. Look at that sinking action! Yes! I also drafted a new lining pattern for Yona. I took the time to actually trace off the coat's original lining pattern and then I made sure to check all of it against the outer shell pattern and such. Hmmm... There were a few things I didn't care for and a few things I thought might become problems so I just decided to draft my own lining and then that way, all would work. Which it did, beautifully. I also traded in the under collar for a bias cut, seam down the center version. Something you would find in the Tailoring book. I felt it would help with the bulk issue considering this fabric was a nice thick heavy wool coating. Other than these few quirks, the pattern for the outer shell was lovely. We got along great. I made but one fitting change and that was to add some width for my hips. Cut my fabric out and bam, I sewed a coat for myself. Of course, I have to talk about the fabric. This was a plaid wool coating that I had lying about for a bit. 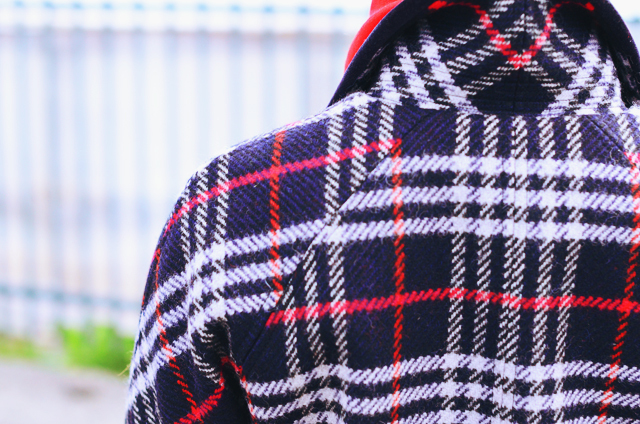 It's rather thick and heavy - perfect for a coat and the plaids were uneven (meaning they weren't perfect squares). 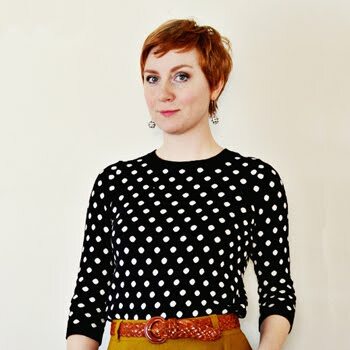 Because the plaid is uneven or unbalanced, the plaid on the sleeve is only matched using the dominant plaid (and only in one direction) which is that grey stripey bit. And just in case you didn't catch my J. Peterman lingo, its one of the most fantastic catalogs to peruse if only for the rather cheeky descriptions of the merchandise. If only I had a gift for such malarky. If only. Bring on the crisp fall weather! WOWZER! You know if its plaid it must be Sunni, and this one is one heck of a plaid! I love your choice of fabric and pattern, and the bias sleeve seam is soooo pretty! I agree with you about all the structural details, too--welt pockets, and especially the bias under collar with seam--much the best choice for shape-ability! It's been a while since I made an overcoat, but I wish I'd used the velvet top collar idea. So nice to NOT have wool if your neck is bare! No time for sewing tutorials, unfortunately, but I bet there are lots of sewists out there who would join up. I totally got the J.Peterman thing and it made me giggle. Your coat is fantastic! I've been meaning to make myself a coat for years, especially with the petite stature/wide hip issues. But I sure haven't. I love that you did, though! Did you find that you needed to make any adjustments to that curved raglan shoulder? She sat in the café on the Left Bank. Remembering that day long ago when they sat there together laughing in the rain. Before Africa.Before everything happened..... and she snuggled into THAT coat.LOVE those catalogs. And your gorgeous coat! I would totally be up for a sewalong! I'm scared to do coats, but god...do I need a new coat. Great job, Sunni. You make the best special-yet-wearable garments. I'm getting my nerve up to start on a coat myself, but so far I've jinxed myself with every single sewalong I've taken part in. Don't let that keep you, I know you'd do a stellar job :-) ! P.S. Happy to hear your shop is going strong! This is a coat you will wear again and again! It is casual with a very chic vibe. I have a real weakness for coats, and will never be able to make up all the coat patterns I have in my collection. But knowing that won't keep me from trying! Love this! I downloaded it, but I'm trying to figure out if I can correctly match the fabric I chose (it has a very wide stripe and I feel pretty stressed about matching raglan sleeves!). Yep, I too suffer from the delusion that I have oodles of time to make all the things and then inevitably become quite surprised when I realize I do not LOL. I think I forget to take into consideration how much time the PREP work takes: tracing, fitting, muslins, etc. LOL. I love this coat! I maybe, could get on board with a sewalong! I need a coat like this in my closet. Can't beat making a coat, even if all the other plans fall through at least you've got something to cover up with and feel good. It looks amazing in plaid, I love the raglan sleeves and shoulder shaping. I made their Andy coat from last year (which does have welt pockets and nice instructions, too) so coat isn't on my list this year, but I'd definitely be up for reading construction details if you did a sew along. plaids matched to perfection. gorgeous! that collar is just... just... wow! Love this! 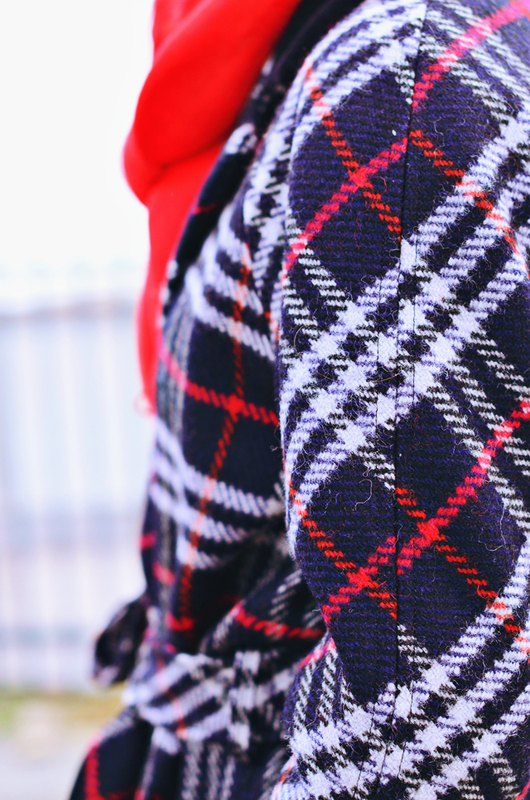 I love plaids especially on coats. It's gorgeous! You did a beautiful job with the plaid matching and all of the detail work. 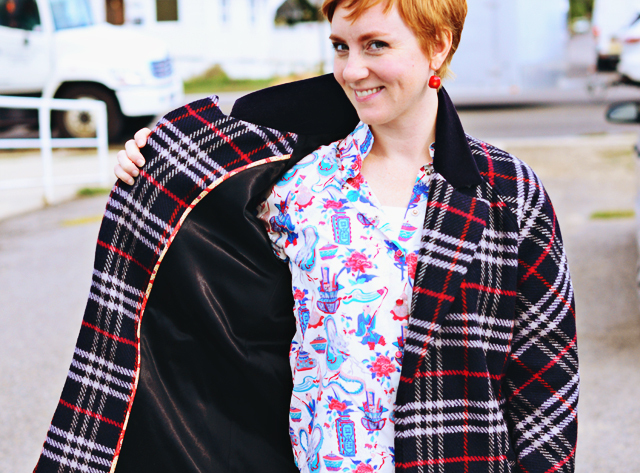 Kasha lining is my go-to for fall and winter coats too. It's pretty much the only kind I use if it's not a summer coat! Now that coat is gorgeous, especially paired with that little red pixie cut. Love it in that plaid. sewalong, PLZ!!! I've been wanting to try making this coat but I'm new to sewing coats, so have had trepidation. A sewalong would be the kick in the pants that I need! It's fabulous and I'm mighty impressed by the check matching! How hilarious about J Peterman - I thought it was an obscure Seinfeld reference - I can't believe they really exist! I have a super plaid I didn't know what to do with - I do now! Sewalong please! Sewalong please. I want that coat with those pockets and collar details. this coat look AMAZING! you are definitely the queen of plaid. i especially love the velvet collar, such a great touch. nicely done! YES PLEASE DO A SEWALONG! I LOVE this pattern and was considering it, but as an advanced beginner am a bit scared of coats. If nothing else it would be a GREAT resource for coat-making techniques, especially drafting your own lining (what?!) and whatnot. Oh Sunni! It's gorgeous!! Just breathtaking! Please please PLEASE do a sewalong! I want to know your secrets. This coat is amazing! Great work! I wouldn't have time to do a sew along, but I love watching you do them because of the great tailoring tips you give! Fabulous coat! Would love to know your tricks! Please do a sew-a-long! I want to make a coat, but I've never attempted something this advanced before, so a sew-a-long would make it possible for me. I learn so much from sew-a-longs. Fabulous coat, Sunni! I hope next time I am in the shop I will find it hanging up for closer inspection. Love the lining, too! And a great way to match uneven plaids, I usually stay away from them. OK, ladies, I have now been to the physical storefront and fingered the actual plaid jacket, and it is fabulous!! A sewalong would be great! Your coat is absolutely stunning! A handmade coat can sometimes toe that thin line between looking handmade or looking like a bespoke tailor in Italy had a hand in its making. Yours certainly toes the Italian side of that line! It is an amazing coat! I love the detailing at the back. A sew along would be amazing! Seeing as I hope to make a couple of coats this fall, I would love a coat sewalong and appreciate your experience/expertise in this area of sewing! I LOVE your coat. Is the fabric sold out? Seriously stylish and I love the brave blue shoes! I absolutely love this coat and thing a sewalong is a wonderful idea. This is lovely! I wasn't sure if I liked this pattern that much at first, but after seeing your version I just have to make one! I live in the Bay Area so I haven't thought much about sewing jackets (it was 96 degrees here yesterday!) but I'm thinking if I start thinking about it now I can hope to have one done by January (ha!). I would love it if you did a sew-along. And also if you were to do some type of workshop with plaids. I love a challenge! Sunni, this coat is gorgeous! That plaid is to die for. I used to collect those J. Peterman catalogs because I LOVED their descriptions. Is it still around?